Pay it forward. Random acts of kindness. I love these concepts. Both of my boys are highly sensitive children. They come by it honestly from me! There’s no lack of empathy here, but acts of kindness can be hard for highly sensitive children. Especially for one of my sons, the depth of his empathy is almost crippling when it comes to acts of kindness toward others. Strange, isn’t it? So how do you encourage these super empathetic children to channel all that empathy into action? I’ve experienced how acts of kindness can be difficult myself and so I understand it well. While in law school, I volunteered for an organization that provided representation in the court system for children who had been removed from their homes because they were neglected or abused. Or both. I lasted two weeks. I went home every night of those two weeks and threw up. I wanted to help – I did. But if I had to see one more child with a cigarette burn on her arm… The little boy with an imprint of an iron on his thigh… Rope burns on body parts… Bruises… Bloated bellies… It was physically more than I could bear to look into faces every day and see the broken souls longing to be repaired. Or at least noticed. So I failed at helping these innocents who so desperately needed an advocate because I didn’t have the skills to help me cope with the emotional experience. So I really want to help give my sensitive child the skills he needs to follow through with his empathetic instincts, even when the going gets tough for him. If you have one or more highly sensitive children, you know that this can either make them highly motivated to help others, or that their empathy can actual make acts of kindness challenging for highly sensitive children. Both stem from a great deal of empathy. But acting on their empathy can be difficult for some highly sensitive children because they empathize so deeply that it can be a lot for them to bear. Highly sensitive children need help to learn how to handle the emotions and rush of empathy that comes with performing an act of kindness for someone in need. Highly sensitive people actually experience more brain activity in the areas of the brain that experience compassion and empathy. (source) It’s estimated that 20% of the population is highly sensitive. A couple of years ago, we were walking Atlanta’s newly opened stretch of the Beltline. We spied a sack with something colorful inside. We couldn’t immediately tell what it was, but a note was attached. On this day what we found on our walk was just about more than I could handle. It was so simple. Inside the ziplock bag was the most beautiful, knit with love hat…just – well, just ever. Pinned to the hat was a note. 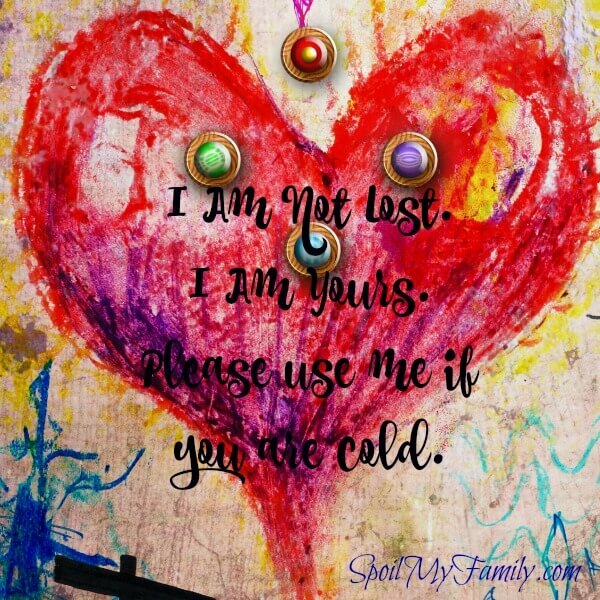 “I am not lost. I am yours. Please use me if you are cold.” That poignant moment pierced my heart in a way I’ve never forgotten. This year, for Martin Luther King, Jr. Day, we brainstormed acts of kindness that we might want to perform. I reminded them of the hat we had found. I don’t knit or otherwise create lovely handmade things – so that part was not an option. But everything else was fair game. I suggested collecting hats that we could leave where people would easily find them when they needed them. My most highly sensitive son felt that, as cold weather was beginning to set in, we should do more. He felt that a hat was not enough. We would collect coats and blankets. We decided that we would leave several care packages consisting of a blanket, a coat, hat / gloves, or whatever we could collect, in areas we knew that homeless people would need them. As we discussed this, I saw that my most sensitive son was becoming more and more detached. I watched my him emotionally back away from our project. This is the perfect example of how acts of kindness can be difficult for highly sensitive children. Simultaneously, my youngest became more engaged as he saw how big the problem was and how many people were impacted. So how could I encourage my oldest to stay involved, knowing that he cared deeply and that this was a project he had conceived and really wanted to follow through on? It was clear that he was on “distressing information overload” so I gave him the space he needed to process all that we had learned. I immediately shifted gears and we took a break from the whole project for a week. When I decided we would go back to it – I was sneaky. I suggested an art project – some watercolors and hearts. (Inspired by this really lovely post from Art Bar Blog!) We all had a great time and I remarked at how beautiful the hearts were and that they made me happy just to look at them. I then “came up with” the idea of sharing a heart on each care package. Maybe they would make the people who received our care packages happy – just like they made us happy! The boys loved the idea and my oldest was once again engaged. I know that these hearts probably ended up as liter somewhere… But they were a great distraction for my sensitive son and a way to get him back on track with something that I know was important to him but that was very challenging at the same time. Slow steps and not forcing something that was emotionally difficult. Make sure your child knows you understood his reluctance is not based in selfishness, but deep caring. This is so important – because our sensitive kids FEEL that we know they are reluctant. They need to UNDERSTAND that we know why they are reluctant. Try the sneaky trick! If you can find a way to incorporate something that your children would typically do (like our art project) and then tie it into the project ultimately, your child will have been “making progress” on the project while being able to take a break from the emotional toll that it can take on them. It helped that there was something that he could lay hands on and physically plan out and do. I think balancing the emotional investment with physically performing tasks helped a lot. I made the final “delivery.” I decided that he probably wasn’t ready to come face to face with a settlement of homeless people yet. We’ll save that for another year. So putting together a small care package for people in need can be a wonderful project that involves your entire family. Many shelters across the country welcome such donations or even have a list of most needed items on their website.